The NC403TS is a tone/visual touchscreen monitor that allows staff to view and interact with calls from their Tek-CARE system. 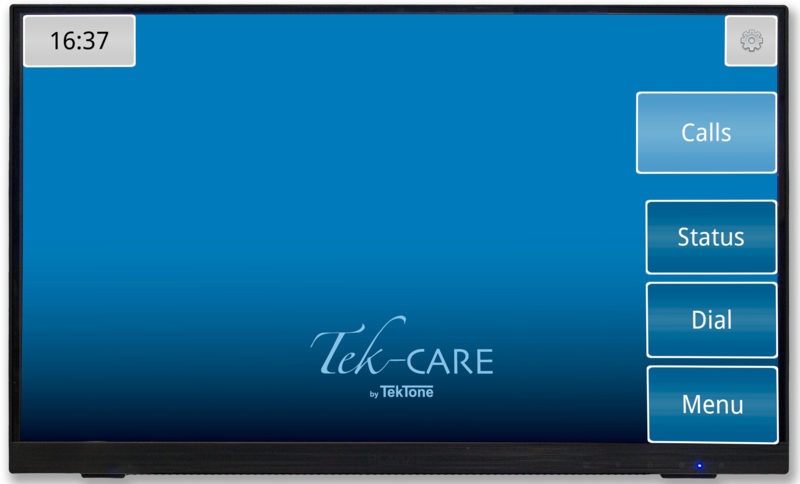 The NC403TS Tek-CARE Monitor is a new product designed to simplify viewing calls on the Tek-CARE Network. The NC403TS annunciates call activity on a sleek 22” touchscreen monitor while utilizing the familiar Tek-CARE user interface. The unobtrusive monitor can be placed anywhere throughout the facility. The benefits of the NC403TS are endless, arriving with complete TekTone hardware and software and requiring no additional outside software. Working with the Tek-CARE Network and NC475 Appliance Server, the NC403TS provides real-time alerts from any connected systems. The monitor also features volume control, a non-interactive display option and the ability to display system faults. Resident information is also available via the touchscreen. Multiple NC403TS monitors can be used in combination with other remote monitors on the Tek-CARE Network with a maximum number of 254 monitor devices combined. For more details, check out the specification sheet. For pricing, please contact our Sales Department at 800.327.8466, option 2 or use our Contact Us form.